Today, when this ‘inspirational quote; came up in in my Facebook feed, I replaced the word ‘life’ with ‘diabetes. I think perhaps it translates quite well. I am certain that diabetes hasn’t gotten easier for me. I’m sixteen years in – still a baby, when I think of the Kellion medallists I met recently – but even though I know a hell of a lot more about diabetes today than when I was first diagnosed, it’s not easier and it’s certainly not more forgiving. In fact, each year as I tick off another diaversary, I worry more and more about complications. Hypos have become less predictable. I still second guess myself; something that I hoped I would not do as I gained the wisdom I expected would come with diabetes longevity. I’m still waiting…. 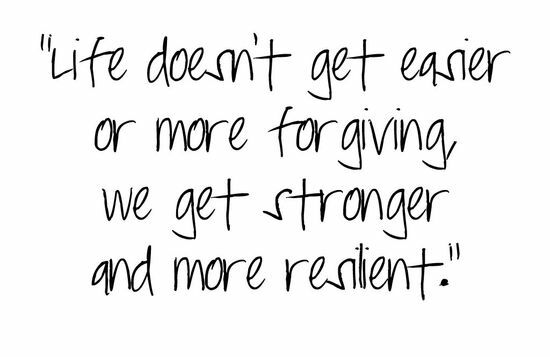 As for getting stronger and more resilient, I know that definitely is true. I’ve found that I can build up my resilience stores – it helps when things are going well and I feel that I’m top of everything. And the strength I have found to deal with some terrible situations has surprised me. At moments where I have thought that I was beaten and broken, from somewhere I have found the strength survive. And often even thrive. I am definitely a stronger person overall because of my diabetes. Whilst diabetes has been fairly gentle to me overall, it has certainly blindsided me at times. But despite that, I’ve coped. I think living with diabetes means we just have to be resilient – it isn’t a choice. Giving up isn’t an option when it comes to this relentless condition. It’s Friday! Here’s the wonderful John Pizzarelli singing ‘I like Jersey Best’.